Every Good Endeavor examines the Biblical origins of work, the problems we have with work, and how powerful mindset is to make work meaningful, fulfilling, less stressful, and ultimately more rewarding. But how often do you step back and put work into perspective? What role does work have in your life? Why are you working so hard? What are your life goals and what role does work contribute to those goals? When we die and look back on our lives, what will we think of our work — the jobs we did, the people we met, the struggles we overcame, the successes, the failures, and how we treated people? This post started, and still is, as a book review of Every Good Endeavor by Tim Keller. However as part of researching for this post, I gathered information on the current state of work. I’m going to start by discussing what I found before moving into the review. While we all have our personal view on work, our jobs and feelings, I feel it helps to understand at a broad level the culture and state of work in the world today. I’m American, so I’ll start with American culture. American culture and society idolizes hard work, dedication, entrepreneurship, risk taking, money, and success. It’s hardwired into our minds early on. We tell our kids they can do anything they want if they set their mind to it and work hard. We idolize people like Steve Jobs and Elon Musk who have literally given their lives for their companies. A work driven culture is not unique to America. China prides themselves on “996” work schedules and demanding environments. 996 is unhealthy and insane — it means working 9AM to 9PM 6 days a week. China is also extremely ambitious. Their public goal is to dominate technology and AI in the coming decade, making China the world leader in advanced technology. Given their ambition, track record, size,and resources, they will definitely be a leader. We have an increasingly “always on” expectation. Work for many doesn’t stop when they get home. Technology has allowed us to take work with us — and increasingly we do. We check our calendars when we wake up, email around the clock, and never turn our minds off. As work has gone global it’s become a 24–7 operation — there is no downtime. In America, and increasingly around the world, work is idolized. Work has become our source of identity, of confidence, of control, and of self-worth. Life for many people is work. It is how we identify ourselves with the world. With this type of work driven culture, it’s easy to see why people struggle finding work / life balance. The culture doesn’t value balance — it values work. I do feel it’s changing — companies are prioritizing balance and having better expectations around schedules. Regardless of what field you’re in, you’re known largely by your work. “He’s a doctor”, “She’s a lawyer”, “I’m an engineer”. The truth is work is a large part of our identity. And we work hard to build and shape that identity. Consider social media. People spend countless hours forming and crafting their LinkedIn profile, posting messages to reflect their values, their ideal image. The things we post, like, comment on, and promote help shape the image we want to portray. And judging by the growth of social media, we work hard at shaping our image. People post about how successful they are, how hard they’ve worked, the struggle and pain they are going thru because of how dedicated and driven they are, how great their company is, how being an entrepreneur and following your dream is the key to success, how much my company values equality, diversity, ethics, etc. From the outside, it appears people are successful, love their their jobs, their companies, their accomplishments, their hard work, their struggles, and want people to know it. Inwardly, a different story is playing out. The American Psychiatric Association (APA) claims that 40 million Americans, about 18% (1 in 5), have an anxiety disorder. That’s over double the world average. According to the World Health Organization, 1 in 13 worldwide suffer from anxiety disorders. Still a high number, but America is much higher than the world average. Why? Why are Americans so much more anxious and depressed? What are they anxious about? While people are anxious about many different things, money and work are numbers one and two — in that order. So while outwardly people love their jobs, the reality is work is one of the leading forms of anxiety. Honestly, given the cultural importance we put on work, success, hustle, drive, etc, it’s easy to see why. Money and work have become cultural idols. Keller calls worry, anxiety, and the need to self-promote yourself the work under the work. It’s a catchy, memorable phrase but it carries a lot of truth. His point is worrying itself is hard work. It consumes time, energy, and stress which could be better directed at doing actual work. Now not only do we have a job, we have a second job worrying about our job. How ironic. Like anything in life, too much of a good thing is not healthy. We need to put work into perspective, into the broader context of life. Work is important and we were made to do it, but I hope we agree it’s not the primary goal of our lives. Perspective and mindset is the key to a healthy relationship with work. That is the focus of Every Good Endeavor. Let’s dive into the book. Every Good Endeavor, by Christian pastor Tim Keller, examines the history, the troubles, and mindset we should have toward work. 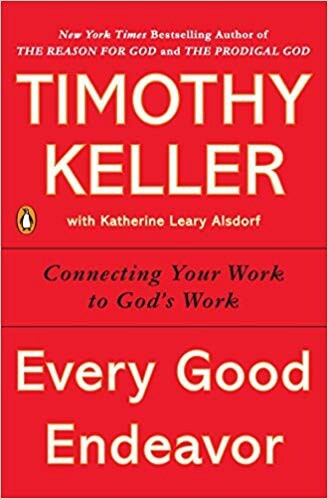 Regardless if you are a Christian or not, the history and perspective Keller brings will allow you to examine how you view work, your mindset, and make you think about how you want to change your mindset towards work. It puts work into perspective. Tim Keller is a Christian pastor and founder of Redeemer Presbyterian Church in New York City. He’s an approachable, down to earth speaker and writer who approaches Christianity from a skeptics point of view. He makes Christianity approachable and understandable, avoiding complicated or overly religious tones in favor of practical, bible based principles and teachings that have “down to earth” appeal. He speaks directly to people’s lives with the goal to generally help, not an attempt to promote religion. He presents the facts, the Biblical point of view, but ultimately leaves it to the reader to decide their truth. In my opinion, his style is extremely effective. You most certainly do not need to be a Christian to grow from this book. I’m certainly not here to sell you on Christianity. In fact, I feel the Christian mindset and values described in Every Good Endeavor are at work and practiced, many times better, by non-Christians than they are by Christians. Regardless if or what religion you hold, the Christian mindset towards work gives you another perspective from which you can pull ideas from to shape your own mindset and perspective. Where does work come from? The book starts off with the Biblical origin of work. Work was created by God. God himself worked. He created the heavens and earth, man and woman, all creation. Because we were created in God’s image, and God worked, we also work. Regardless of how work came into existence, we all realize work is a basic human need that we have. We need to work. It gives us a sense of accomplishment, of pride, and meaning in our lives. If we didn’t have “a job”, we would have to do something with our time. Consider the person who dreamed of retiring. But after a few months in retirement, boredom sets in. Humans weren’t made to sit and do nothing. So why do many people not enjoy work? Why is work stressful? Why do we struggle with work related anxiety? The Bible tells us that work was not designed to be toilsome labor. However after Adam and Eve disobeyed God, sin entered the world. As part of this great fall, work became difficult. Jobs became “work” in the toil sense, which is not what God originally intended. He intended for us to enjoy our work, as He enjoyed work. He designed work to be a source of happiness, fulfillment and pride as it was for God himself. God also rested, so should we. We must stop to enjoy the work we have done. That is part of life. We live in a world which craves affirmation. It’s easy to be a workaholic, but we need to put limits on our work. By many cultures, work was viewed as demeaning. Even today, many look down on “low class” jobs, giving more respect to the CEO than the cook or janitor. The Bible tells us that God does not look down on anyone. Case in point: Jesus. Jesus was a carpenter. Not a CEO or position demanding high organizational authority. The lesson here is to not look down on anyone. Respect those who clean the floors as much as the CEO. All work has dignity the way God designed it. How to you measure success in the work you do? For many, it’s by the size of the paycheck. For others, it’s about the respect you’re given from others. For some, it’s about helping others. Keller makes a point thru the book which I feel is powerful for us to reflect on as we change our mindset toward work. Work should be a calling, not a vocation. Work should be something that we do for others, not ourselves. Work only becomes a calling if you do it for something bigger than yourself. It’s here, in serving others, that you find the most fulfillment, joy, and sense of accomplishment from your work. Today’s companies have realized that purpose and mission are more impactful than money and profits. People want to work for a mission, a cause, that is bigger than themselves. For example, Satya Nadella is executing one of the most successful corporate turnarounds in history by focusing on purpose, mission, and empathy in how he leads Microsoft. Interestingly, he based his philosophy by focusing on mindset. Companies are increasingly priding themselves on their ethics, values, and generosity. They’ve also realized that what’s good for people is also good for business. And that’s good for everyone. For Christians, Keller reminds us that we are saved by faith, not works. Jesus came to save us, our battle has already been won. You can rest assured in your work that regardless of how successful or not you are, you can’t be more saved than you are today. Knowing that, there is no reason to be anxious or worry about work or money. Be humbly confident in your work. Also, Christians realize that God provides work and we are working for Him. Only your best will do. Christians should do their absolute best work, never cutting corners or being unethical, knowing they are working for God, not man. In this section of the book, Keller lays out problems with work. Why is work hard? The Bible tells us it’s because of sin. Sin permeates all aspects of our lives, including our work. We will experience pain, envy, conflict, frustration, and fatigue. The Bible is full of stories about how kings, who had everything they wanted on earth, set out to find meaning in life. They tried to learn everything, spend all their time on pleasure, and accumulate great wealth. Their conclusion was even when they accomplished their goals, it didn’t give them a meaningful life. The only way to have a meaningful life is to work for others. Working for things of this world is pointless. We can’t take them with us when we die. Choose work that fits your gifts. Take an honest inventory of what makes you great, where you fit, and choose work accordingly. It may mean taking less money or status, but ultimately you’ll find more fulfillment. Choose work that benefits others. Watch out for unethical people and companies. Work to benefit your field. Make your industry better for the next generation. We’ve mentioned earlier how much more meaningful and impactful purpose and mission are to job satisfaction and how companies are figuring that out. Still, for many, work is about themselves. Our jobs become our source of pride, power, and security. This leads to competition, envy, struggle, and ultimately idolizing work. In the Christian world view, everything you have has been given to you by God. The country you were born in, the opportunities you have, the money you’ve made, the people you come in contact with, your drive and ambition. Everything comes from God. Christians should possess a humbleness and appreciation for everything they have and should not set their sights on selfish motives. Part 3 is all about mindset. This is where the book became really valuable to me personally. I’m a big believer in power of mindset. I feel the mindset you have controls your actions, your thoughts, your success, and your happiness. If you want to change your views on life, control stress, run a marathon, start a company, it all comes down to your mindset. Carol Dweck’s popular book mindset (the book Satya Nadella based his leadership style at Microsoft on) is a good starting point towards understanding the power of mindset if you’re interested in learning more about the subject. Whether you realize it or not, you have a mindset. If you don’t take away anything else from this blog post, I really hope you spend the time examining your mindset. Not just regarding work, but your mindset towards life. Here, we’ll just talk about work, but mindset controls everything you do. So, what should our mindset be to have meaningful, productive, and rewarding work? There is no right or wrong answer. It ultimately depends on your values, your North Star. Do you value power and authority, wanting to climb a corporate ladder? Are you grateful for your work, or do you feel the company owes you something? Be grateful for what you have, in any situation. Regardless if you are rich, poor, employed, or unemployed — be thankful. Love others. People are the most important thing on this planet. Take care of people. Do exceptional work. Don’t cut corners. Only the best will do. Your work should be honoring to God. Work hard, but do not idolize work. Have perspective. Work should be your “calling”, not a vocation. Work is not about money. Do not worry. Our place in heaven, with God, is secured thru the death of Jesus. By grace, we have been saved. Our battle has been won. We can work in humble confidence knowing that God will provide. I bet you didn’t expect a book review about work and Christianity to be related to AI. Neither did I. But as it turns out, AI is highly relevant to the discussion on work and perspective. AI is literally transforming the world. Law, logistics, medicine, agriculture, manufacturing, there are very few industries which will not be revolutionized by AI. AI is advancing humanity at an amazing pace. AI showcases the best of what can be accomplished thru work. Unfortunately, AI also showcases the worst of work. Those in AI work extremely long hours and give their lives to their work. I watched an excellent TED talk by Kai-Fu Lee titled How AI can save our humanity which literally opened my eyes to how powerful of an idol work has become. Kai-Fu is a world leading AI researcher. He dedicated his life to AI, working insane hours and priding himself on his work accomplishments. Until Lee was diagnosed with cancer, which led him to profound reflection around work. He researched death and specifically the regrets of the dying. He found that those dying regretted not spending enough time with their family and spreading love to others. Nobody regretted not working longer hours. Lee’s cancer went into remission. Lee reprioritized his life and mindset toward work. He reduced his work hours and prioritizes family over work. He also realized that humans have something that AI doesn’t — love and compassion. He concluded that AI has the potential to allow humans to focus on work serving others. Elderly care, teaching, mental health are all job growth areas. What Lee found is similar to what Keller discusses in his book. That the path to work fulfillment is thru serving others and working for something bigger than yourself. That in the end, meaningful life is about loving others. For me, Every Good Endeavor put work into perspective. I struggled with work for 20 years. I have fallen into the trap of working around the clock, taking on too many side projects, spending countless hours trying to learn every technology imaginable, worrying that I’m not keeping up with others, losing my job, not being able to support my family, you name it. But after years of idolizing work, I’m realizing it needs to be put into perspective. I’m not famous like Kai-Fu Lee, worked nearly as long or hard as he has, but I’m going thru a similar perspective shift that he did. I realize now that work has meaning and value, but it doesn’t define me as a person. Time with family is more important than work. And serving others is more meaningful than serving ourselves. I also reevaluated my mindset, being much more grateful and content with what I have today, not what I could have if the current project I’m working on or company I’m building is successful. As a Christian, I appreciated Keller’s reminder that there is no need to worry. God is in control. I have the confidence and strength to face any trial that comes my way. Does putting work into perspective mean I’m going to slow down? Not a chance. Setting boundaries on work allows me to clearly focus on work when I’m working, clearly focus on life when I’m not. Boundaries around work are necessary and healthy. I’m much less worried and much more productive both at work and at home. Which is good, because I have a lot of things to learn and a lot of code to write. Hopefully this review prompts you to reflect on the role of work in your life. We spend so much time working, we owe it to ourselves to reflect, reset, adjust, set goals and plan to make work meaningful, fulfilling, less stressful, and ultimately more rewarding. A very small (1000 person) survey from the American Psychiatric Associated which concluded 40% of Americans are more anxious today (2018) than last year. What is interesting is the “future of the nation” is one of the largest causes of stress and anxiety. Anxiety about work was not directly asked in the survey, but “paying my bills” was high on the list — definitely work related. Facts on statistics which reveal that 18% of Americans (40 million people) suffer an anxiety disorder in any given year. Explains how prevalent work related anxiety is and the irony of people who make more money are among the least happy, most anxious. Offers bland advice on how to not be anxious: talk with your boss, quit, or do nothing. The framing of anxiety and statistics around anxiety in this article is good. The guidance around how to address anxiety doesn’t get to the heart of the problem — changing your mindset. An absolutely excellent talk from Kai-Fu Lee, a world leading AI researcher. Lee discusses how advances in AI are going to replace, augment, and create jobs in different sectors. Lee was diagnosed with cancer, which led him to profound reflection around work. He realized how foolish it was to base his life around his work accomplishments. He reprioritized his life, putting his family first. He examined death and researched the regrets of the dying. Those dying regretted not spending enough time with their family and spreading love with others. He concluded that AI has no love. AI will take away routine jobs, it will create jobs which show love and compassion to others. Definitely watch this video if you are interested in AI or mindset toward work.